YouTube Tuesday: What’s in my Rock ‘n’ Blog Box?! I’m back with my second YouTube video to show you one of the perks of being a Blogging Ambassador for the Rock ‘n’ Roll Marathon Series! You can CLICK HERE to visit my YouTube channel or just scroll down to watch it here. If you like the video, subscribe and give it a thumbs up! 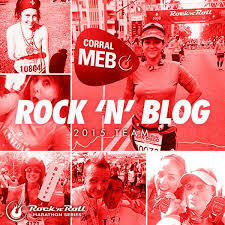 Have you run any of the Rock ‘n’ Roll Marathon races? Which ones? Are you a brand ambassador? Share which one and your favorite perks! Do you own Maui Jim sunglasses? What’s your favorite style? Love your box!! I’m really curious about the cereal! And, I know this is completely off topic, but how often do you weight train and what kind of workouts do you do? Your arms look AMAZING! I do some light free weights about 5 times a week…thank you!!! What a great video! Loved seeing all those goodies, I have CEP compression socks, they are a life saver! The fun atmosphere really helps!!! The videos are fun…and it is your blog….you should definitely continue doing them….love the shirt, too. Love the videos and your blog!! Keep them coming!! I’ve done 2 Rock n Roll series races, The Country Music Half and The DC Half. They have great courses and it’s always nice to have the live music. Although we missed the music this year in DC due to it raining the ENTIRE race! I’ll be running Vegas this year for the first time. It should be a lot of fun, too! I LOVE the Oiselle community!!! I ran Philly Rock N Roll half when I lived there, as well as Dallas. Always fun – always awesome expos. I am not a brand ambassador but I would LOVE to be!! No Maui Jim’s for me.. I’m a Persol girl through and through! Have a fabulous day!! I’m running the Rock n Roll Dallas half this March–how is the course?! I loved it! It was pretty overcast and cool when I ran it, so that definitely was a good thing – but the course is beautiful, especially around miles 7-9… you run through a super ritzy residential area… fun to look at all the nice houses Good luck! I am a NUUN ambassador this year and have loved it. I do own some Maui Jim sunglasses but I bought them over 8 years ago and don’t have a clue what style. No RNR races for me yet but maybe Nashville in 2016. Great video. Nashville is a blast, but get ready for heat and hills! I’ve never run a Rock ‘n’ Roll but man would I ever love to! I think Andrew is thinking about running the Phoenix one in January though! So although I won’t be running it, I can still experience it. They sound like so much fun. Phoenix is on my bucket list! This was super cool!! I loved it and seeing all the goodies you got! And you are so cute! I love that Oiselle tank too!! I had a blast at the Music City half but am dying to run the Rock n Roll in Las Vegas! It’s on my list for sure! This year will be my first Vegas!!! How fun! I have only run one Rock’n’Roll race and it was the Nashville one. It was SO much fun though! I am debating running NOLA in February. I am hoping to stumble on a good hotel deal before then. Nola is on my bucket list!!! The Vegas RNR is definitely on my list of top ten dream marathons. My boyfriend and I have it for 2016 and would turn it into a vacation if I decide next year is the year. I actually just became a Fit2Run ambassador for the local Tampa store. And when I say “just”, I mean it…I don’t even know what kinds of perks I get. I’m so excited though! Congratulations!!!! It’s so fun when you get to partner up with a brand you love. I’m so excited to run Vegas for the first time this year! Ahh! We were supposed to run Vegas, and the hubs bailed! Wish I knew you were running. Maybe there is still hope. Such a fun video! What great goodies! I love fun mail days! And that Oiselle tank just keeps inching higher and higher on my wish list! It’s one of my favorites!!! I love your videos! I can’t help but smile while watching them, you’re so upbeat (and, uh, JOYFUL 😉 ). My first Rock ‘n’ Roll race is going to be the Las Vegas half. I’m so excited for it, and I hope I get a chance to meet you there! This will be my first Vegas…woohoo!!!! I’m a mess, but thank you!!! OOOO! I love that hat! I don’t really wear hats but I LOVE THEM!!! Good for a bad/I didn’t wash my hair – day! LOL! That’s my husband’s favorite run food!! We’re all just running to eat, lol!???? My new (supposedly healthy) drink is tart cherry juice. I dunno. Does anyone? I’m sure it’s loaded with sugar, albeit naturally.